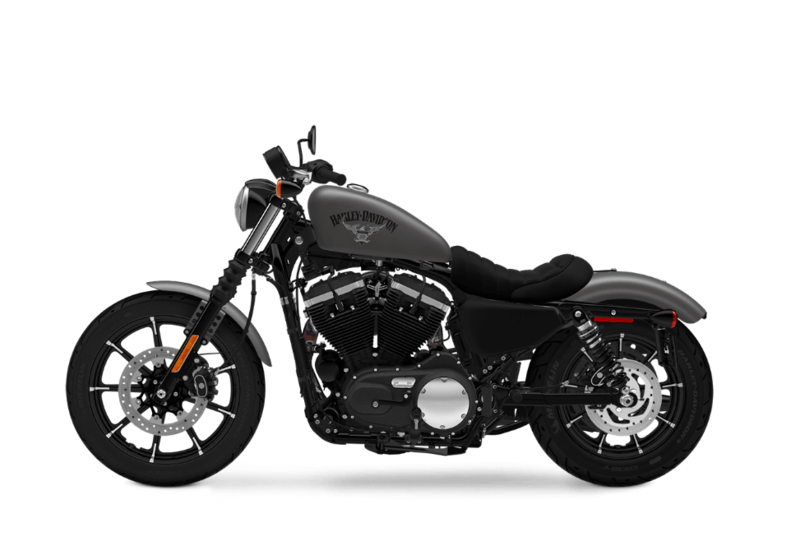 The Harley-Davidson® Sportster® lineup is known for its back to basics approach of combining high performance with a minimalist style, and the 2016 Harley-Davidson® Iron 883™ continues this tradition but with many improvements. 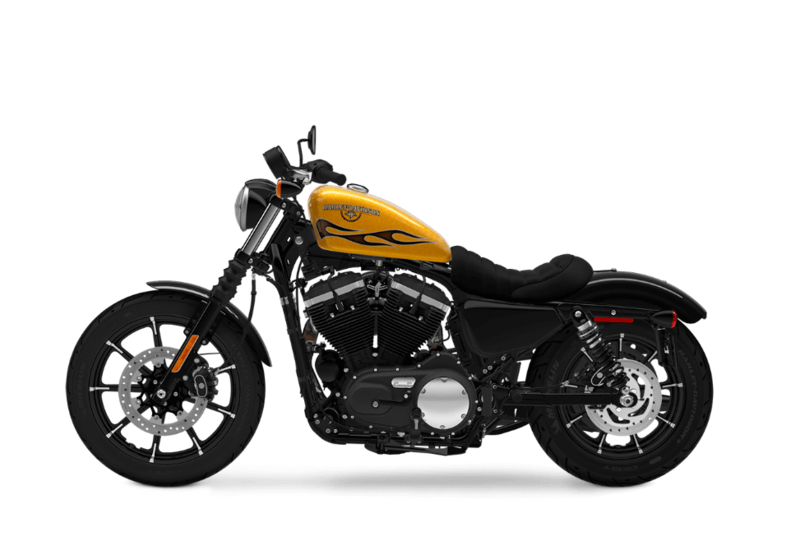 The new Iron 883™ fits firmly in this model lineup and offers a long list of premium details to round out the classic Sportster® package for riders from Denver, CO. 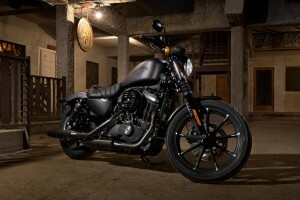 Learn more about this new bobber-styled bike here at Avalanche Harley-Davidson®! An air-cooled V-Twin Evolution® engine provides raw power for the Iron 883™. 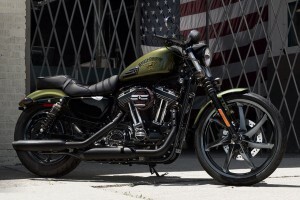 This is a robust engine that is a worthy heir to the legendary performance heritage of Harley-Davidson®, and we’re certain that once you twist the throttle and feel all that fierce, rumbling power you’ll wholeheartedly agree. Evolution® Engine – Sometimes referred to as the Blockhead, the Evolution® engine first appeared in 1984. 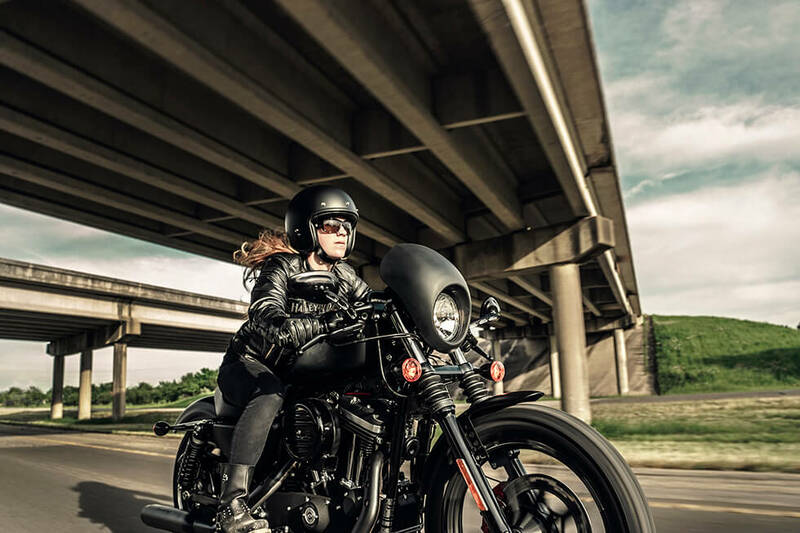 A descendent of the iconic Shovelhead and Ironhead engines, the Evolution® benefits from an array of new advanced technologies to deliver quick acceleration and reliable performance wherever your ride takes you. Blacked Out H-D Styling – The authentic Harley-Davidson® styling of the V-Twin Evolution® engine features black powder-coated cylinders, heads, and rocker covers, along with a round, old school, glossy black steel air cleaner cover and polished chrome pushrods. It’s quite simply a work of old-school iron art. 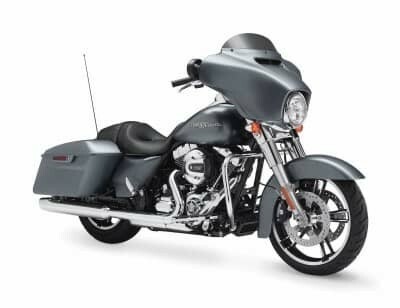 Innovation – Electronic fuel injection along with lightweight aluminum cylinders and heads, which aid in cooling, are two key features of the innovated engineering of this powerful V-Twin. 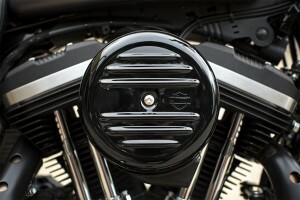 The engine is rubber-mounted, so you can count on it to keep vibrations to a minimum. New advanced technology is employed throughout the Iron 883™, and all of it is designed to provide more confidence while putting you firmly in control. Integrated Electrical System – All of those relays, fuses, wiring harnesses, and switches are hidden with the integrated electrical system, giving the bike a very clean, stripped down look. 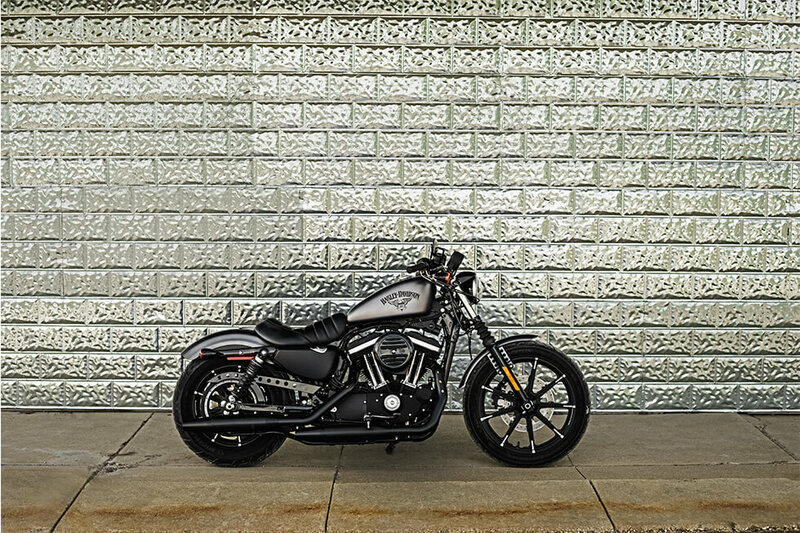 Foundation Brake System – If you want a bike that can stop on a dime, then the Iron 883™ with the new Foundation Brake System is the one for you. Featuring 300mm rotors, a big front caliper with 34mm pistons, and an all-aluminum rear master cylinder with reservoir, the braking is responsive and dependable. There’s also a new all-aluminum front master cylinder which will cut down on friction while improving efficiency, and stainless steel braided lines that add a smart touch to the bike’s slick, retro design. Floating Brake Rotor – With its blacked out finish, the new floating brake rotor is a perfect compliment to the tough looking machined wheel, providing a no-nonsense, aggressive look. 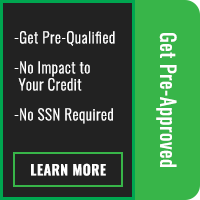 Optional Security System – The optional factory-installed H-D® Smart Security System with wireless fob automatically activates when you leave bike, and automatically deactivates when you return. Ergonomic Hand Controls – Comfortable, easy-to-use, ergonomically designed hand controls incorporate trip and “start” switches, as well as self-canceling turn signals. The brake levers are easy to reach so you feel in command and in control at all times. Closed Loop Exhaust System – The robust closed loop exhaust system includes dual mufflers with exhaust shields and a catalyst with mini heated oxygen sensors designed to improve emissions. The systems integrates perfectly with the powertrain to maximize performance. 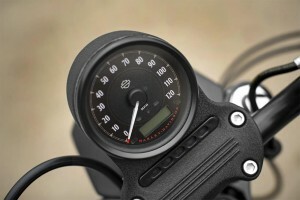 Tach and Gear Indicator Readout – A tachometer and gear readout are included in the large central speedo. The displays are easy to read and are activated by a trip switch. Optional ABS – Anti-lock brakes are an available option that’ll provide superior stopping power in all conditions. 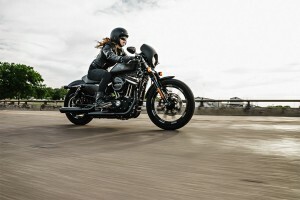 In the minimalist design of the Iron 883™, pure Harley-Davidson® style combines retro flare with a contemporary look This is a bike that’s going to command a lot of attention wherever you ride. 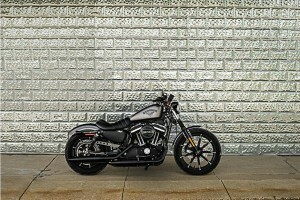 Blacked Out Look – The standard blacked out look of the Iron 883™ ties right into its outlaw roots. 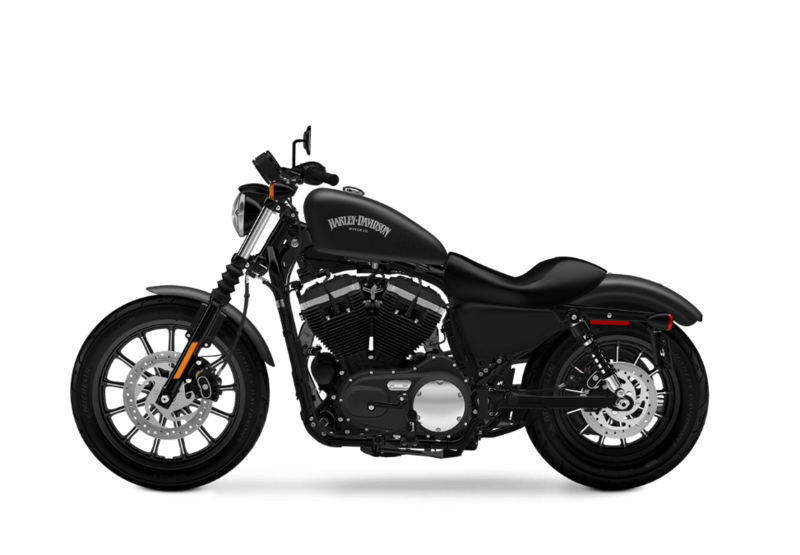 The black powder-coated engine, glossy black air cleaner cover, and black oil tank cover, along with the black belt guard, black front forks, wheels, and dragster bars, combine to make one unmistakably dark and classic statement. Fuel Tank – The sleek peanut fuel tank holds 3.3 gallons and sports a sweet tapered profile that can only be described as classic. 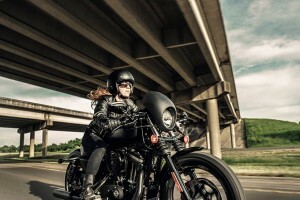 Drag-Style Handlebar – The low-rise drag-style handlebar is pure old school bobber. With a slammed design and black hand controls, it’s consistent with the lean and mean style of the Iron 883™. Hard Candy Custom™ Paint – The available Hard Candy Custom™ Gold Flake paint ups the ante on raw custom attitude and rebel style. This large metal flake finish is applied in layers so it’s durable, darkly bright, and totally unique. 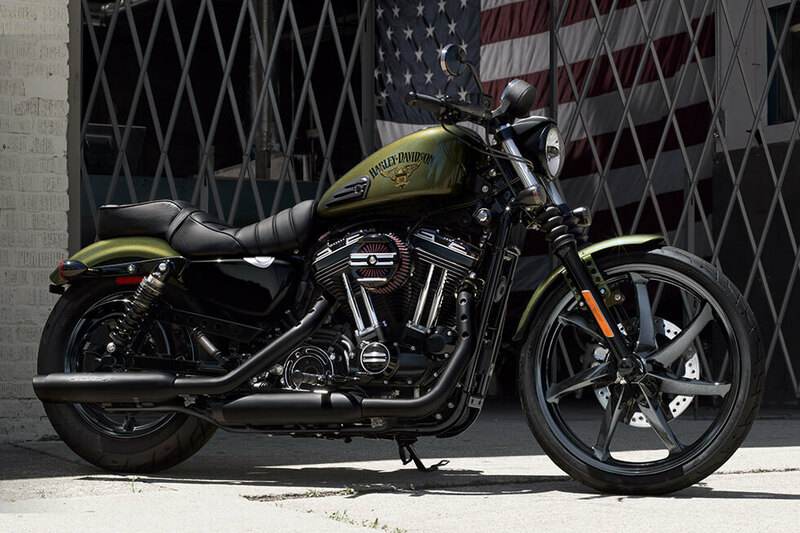 Street Inspired Paint – The Iron 883™ is unquestionably a street bike, so it’s important that the finish be durable and ready to take on the meanest urban landscape. You’ll find that the colors blend in to the streetscape with a finish that is tough and low maintenance. Side-Mounted License Plate – The side-mounted plate bracket contributes to the stripped-down styling, keeping it all clean, raw, and lean. Stop-Turn-Tail Lights – The vintage style bullet taillights feature stop beams, turn signals, and running lights in a smart, all-in-one design. 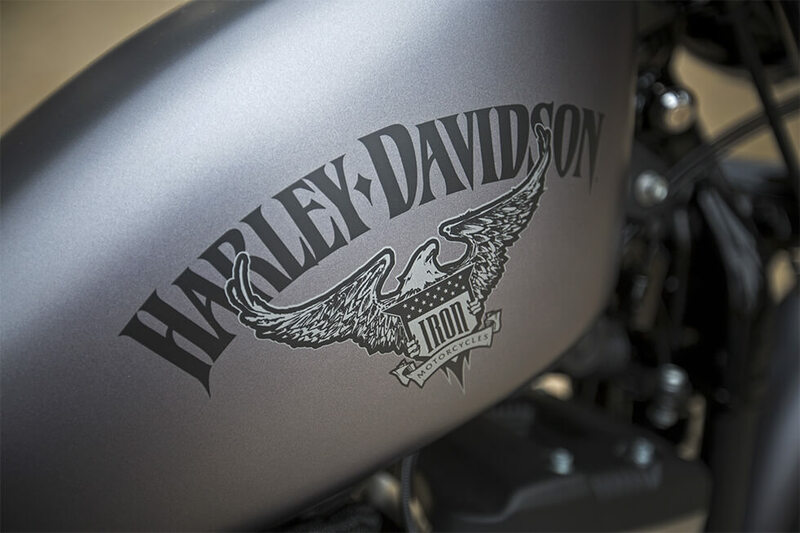 Bullet Hole Details – Like the old school “lightening holes” that bobbers used to drill into the metal to make the bike lighter, the bullet hole design in the front fender, exhaust header shield, and belt guard revisit that an iconic rebel dragster look. Tank Graphic – The eagle and shield tank graphic is an eye-catching and super-cool vintage way to recall tattoos sported by soldiers in WW II. 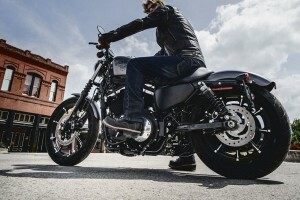 Sure handling makes the Iron 883™ a bike you can feel confident riding across town or on the interstate. Michelin® Scorcher® Tires – These are high grip tires that are race tested. 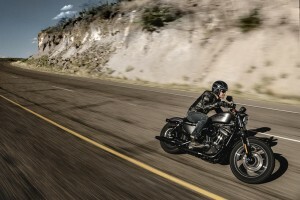 They have a deep-cut tread that make them ideal for all-weather riding and long-lasting performance. Low Seat and Slammed Suspension – With lowered front and rear suspension and a low, 25.7 inch solo seat, you’ll benefit from easy handling on any road. 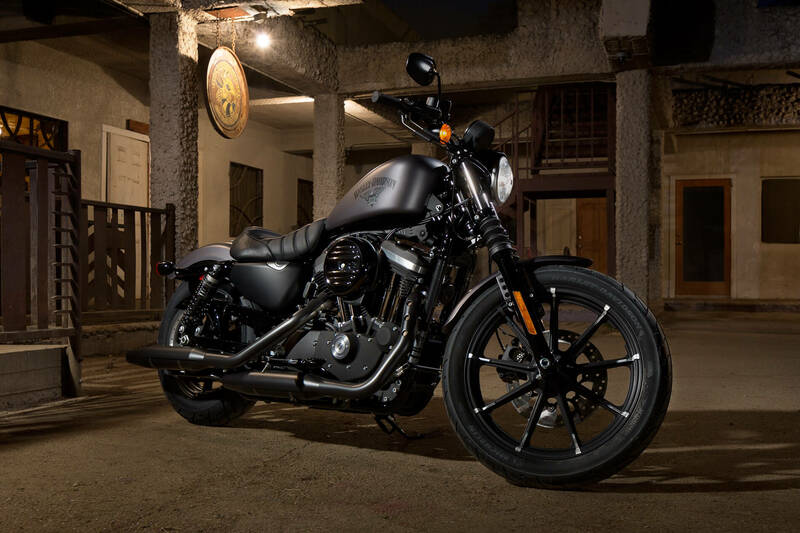 Machined 9-Spoke Wheels – The distinctive 9-spoke wheels with blacked out rims have a raw machined look that fits the stripped-down style of the Iron 883™. With the first-rate comfort features of the Iron 883™, you’ll be able to stretch out and enjoy the ride every time you throw your leg over the saddle and head off down the road. 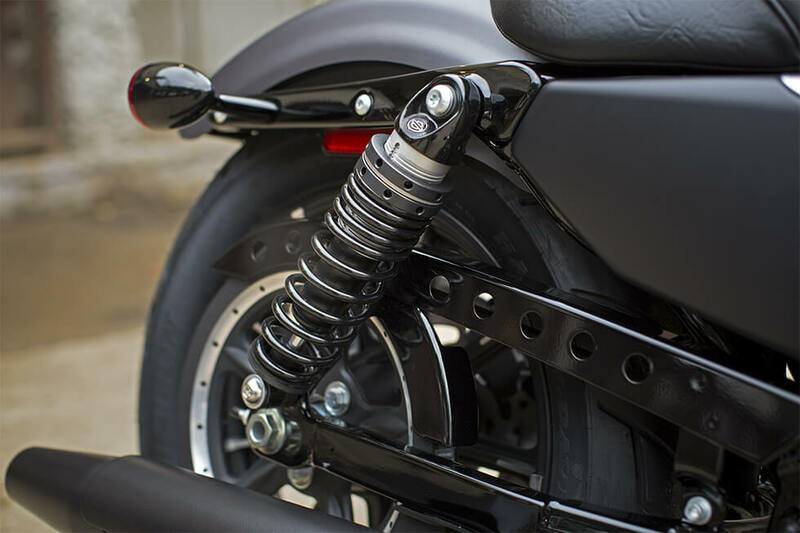 New Front Fork with Cartridge Dampening – Improving the easy handling and comfortable ride of the Iron 883™ is the solid front fork with cartridge dampening. Together they provide responsive performance on both twisting mountain roads and smooth open straightaways. 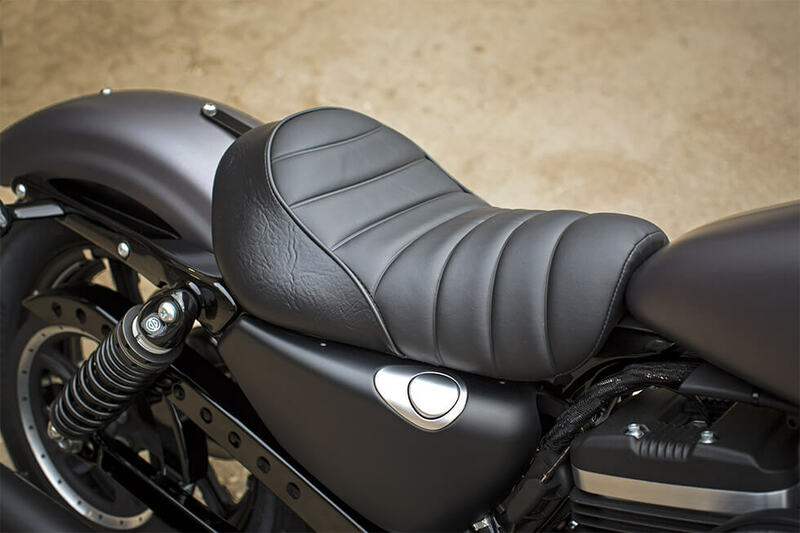 Tuck and Roll Seat – All that can be said about the tuck and roll solo seat is that it’s a real classic. Inspired by the iconic bobber bikes of the past, this seat is plush and comfortable, and it looks great too. Mid-Mount Controls – The mid-mounted controls make it easy to get into that confident, relaxed riding position with everything you need in easy reach. New Emulsion Rear Shock – The new emulsion rear shock is designed to make a ride down even the roughest of roads smooth and even. A screw pre-load adjuster is included so you can set the ride the way you like it.